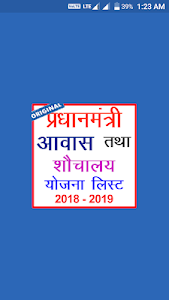 This app is designed for all the villages of India which can be easily seen by the name of the village's name if it is in the list, if you want to see any member in your house under the housing scheme and toilets scheme. Or you should download the App. 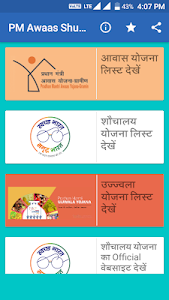 Anyone can easily find PM Awaas Yojana list and Government to poor families living in rural areas in India has gone Prime Minister Awaas Scheme is also known as PM Awaas Yojana. PM Awas Yojana & Shaochalay Yojana is a programme by Government of India to ensure “Housing for all by 2022’’. Under this, there is a Creditlinked Subsidy Scheme on home loans for properties in urban market belonging to Economically Weaker Section (EWS), Low Income Group (LIG) and Middle Income Group 1 & 2 (MIG). It can be availed for new or resale purchase of home, construction, or for extension or improvement of rooms, kitchen, toilet etc.Which is quite a poor family in rural areas.Is provided to the housing by the Prime Minister's residence scheme for poor families. If you applied for the Prime Minister Housing Scheme. Two types of facility are provided in this application. You can view your member's name in the toilet plan list and in the housing scheme list both through this app. If you have to look at the Awaas plan list, then you can click on the live accommodation list and if you want to see the toilet list, click on the Shauchalay list. Note : We are gathering Awaas & Shouchalay list from the Government Departments and showing it without any modification. In case of legal procedure we highly recommend to consult with respective department in the city/state. This app works for 100% as this is from a know government records. If you find any problem in fetching car details, do write it to us and we will solve it out as soon as possible. 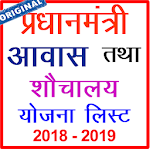 Similar to "PM Awaas Shuachalay Yojana List 2018 (PMAY)"